Vacuum Maker Oreck to Stay after Katrina The Oreck Corp.'s vacuum cleaner plant is up and running again in the Mississippi Gulf. The company plans to keep its factory there and its headquarters in New Orleans despite the devastation wrought by Katrina. The Oreck Corp.'s vacuum cleaner plant is up and running again in the Mississippi Gulf. The company plans to keep its factory there and its headquarters in New Orleans despite the devastation wrought by Katrina. The Oreck Corp. has assembled 20 trailers to provide emergency housing for plant workers who lost homes to Hurricane Katrina. 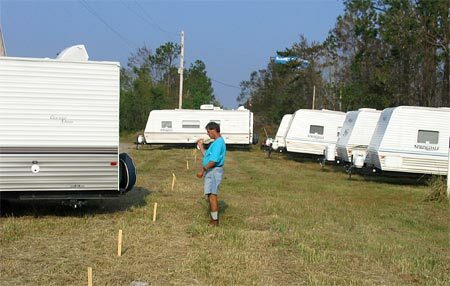 Marketing Vice President Steve Hanson calls the RV park where the trailers are parked Oreckville. On Wednesdays, our business report focuses on the workplace. Today getting a plant up and running after Hurricane Katrina. In the midst of the devastation caused by Hurricane Katrina, a vacuum cleaner company is helping to clear a little bright spot. The Oreck Corporation makes vacuums in Long Beach, Mississippi, where many of its 600 workers lost everything in the storm. The company has raced to reopen its factory, which has taken some extraordinary efforts. NPR's Scott Horsley reports. Hurricane Katrina dealt a double blow to the Oreck Corporation. The company's headquarters are in New Orleans and its lone US factory is located on Mississippi's Gulf Coast. CEO Tom Oreck had taken shelter in Houston. When he learned the Mississippi plant survived the storm largely intact he was determined to reopen quickly as a beacon for the region's recovery. Mr. TOM ORECK (CEO, Oreck Corporation): People need, you know, shelter, which we brought in. They need food and water, which we shipped into Long Beach. But they also need to see that they have reason to have hope; that there is a path to normalcy. And that included getting the plant operating so the people now saw that they had a job, they had a place to be, they had a paycheck. It's a way for people to start to move back towards a normal life. HORSLEY: Even before the storm, Oreck had relocated some of its call center operations. A temporary administrative office was set up in Dallas. And marketing vice president Steve Hanson was dispatched to Mississippi to help provide housing for displaced factory workers. Mr. STEVE HANSON (Marketing Vice President, Oreck Corporation): That's when I became the trailer king. HORSLEY: Earlier this week, Hanson led a caravan of trailers the company just purchased along a two-lane road lined with downed trees and power lines. The destination was a newly expanded RV park that Hanson has taken to calling `Oreckville.' Soon it will provide a rent-free home to 20 families from the Oreck plant, those with no place else to live and whom the company can't live without. Mr. HANSON: In this area we have a good chunk of the good skilled laborers working at our plant, so it was a very important for us to work very quickly to let them know that we can get this up and running. I hope we've succeeded. We started this morning with our first shift run. We had the whole group from the plant in there and people seemed to be charged. HORSLEY: Hanson says the plant's employees have shown the same kind of teamwork recovering from the storm that they do in the factory when a big order comes through. Workers volunteered their own trucks and pricey gasoline, for example, to haul the trailers into place. Sitting behind the wheel of his pickup, Bill Potter was asked what he thinks of the plant's reopening. He clasped his hands together in thanks. Mr. BILL POTTER (Oreck Employee): You really never know what a company's going to do, or how far they'll go. And as far as I'm concerned, Oreck's went way beyond. I mean, he's come through for the employees in a big way. And it means a lot. It really does. It shows the people that he does care. It's not just a business. HORSLEY: Emergency generators were in short supply after the hurricane, but Oreck found some in Miami and, with help from the Mississippi governor's office, managed to secure fuel for them. Last Friday, Tom Oreck hosted a cookout for plant employees and turned the lights on for the first time since the storm. HORSLEY: Sandra Dixon(ph) is looking forward to that. Her husband, Joe, is a machinist at the plant and, with their own home destroyed by the hurricane, they were the first to move into the company trailers. Mrs. SANDRA DIXON (Wife of Oreck Employee): Joe works hard and we'll get it all back. This time next year, you look us up and we're going to be living in a house and we're going to be looking back on this with some sad memories, but we're going to be able to laugh about some of it, too. HORSLEY: That day is still a ways off. Some Oreck employees are still unaccounted for, and the plant is still trucking in basic supplies, such as food and drinking water. But now when some of those trucks leave the plant, they're carrying new vacuums with them. Scott Horsley, NPR News.